The Championship was the third most-watched league in European football during the 2016-17 season. The Premier League tops the list with total attendances of more than 13m, with Germany's Bundesliga second. England's second tier, with an total of more than 11m, ranks higher than Spain's La Liga, Italy's Serie A and France's Ligue 1. League One - which was won by Sheffield United - is ninth in Uefa's Club Licensing Benchmarking Report. The Championship was fourth in last year's report and enjoyed an average attendance of 20,125 during the 2016-17 campaign. Almost two thirds of Premier League clubs are foreign-owned compared to 58% of Championship clubs. 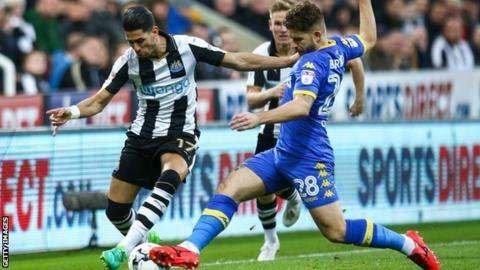 Title winners Newcastle United's 1-1 draw with Leeds United saw the league's highest attendance of the season, with more than 52,000 fans taking their seat at St James' Park. In League One, more than 31,000 people watched Sheffield United defeat Chesterfield 3-2 at Bramall Lane. Uefa's report also found that the Premier League and Championship continued to top the list of foreign club ownership last season. Almost two thirds of Premier League clubs have foreign owners compared to 58% of Championship clubs. For the first time, the average wage bill of the Premier League (153.9m euros) is more than double that of the next highest-paying league - the Bundesliga (75.3m euros). Five Premier League teams - Manchester United, Chelsea, Manchester City, Liverpool and Arsenal - feature in the top 20 clubs by wages. For the first time in European football, 11 clubs have reported aggregate league attendances of over one million. West Ham, Celtic and Liverpool have now surpassed the one million mark, joining Man Utd, Arsenal and Man City in the top 11. England's 20 top tier clubs together reported more revenue than all 597 clubs combined from the 48 smaller UEFA countries (all except Germany, Spain, Italy, France, Russia and Turkey). Twelve English clubs feature in the top 30 revenue rankings, with Man City (sixth), Arsenal (seventh), Chelsea (eighth) and Liverpool (ninth) all in the top 10. English clubs occupy 16 of the top 20 places in the broadcast revenues table. Man Utd is top (146m euros - 21% of total revenue).